To meet the variegated specifications of our renowned clients, we are engaged in manufacturing and supplying a wide range of Kitchen Sink Unit. •Used in kitchen for washing vegetables and utensils. Avail from us a world class array of Corian Kitchen Sinks. They are made from superior quality of raw materials like stainless steel, steel etc. The range is available in various sizes, shapes, unique designs and patterns so as to suit diverse requirements of our clients can be fulfilled with ease. 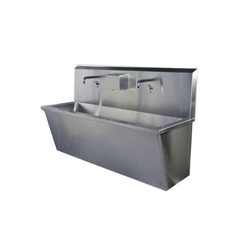 We are a remarkable entity, engaged in manufacturing high quality ambit of Commercial Kitchen Sink. We are a renowned organization that is engaged in manufacturing and supplying precisely designed range of Washing Utility Section. 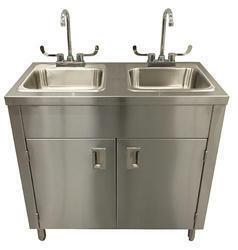 The stainless steel sink structure is capacited to wash bulk of utencils. The company manufactures sink tables in fine grade of stainless steel ensuring corrosion resistance, rugged construction and longer service life.